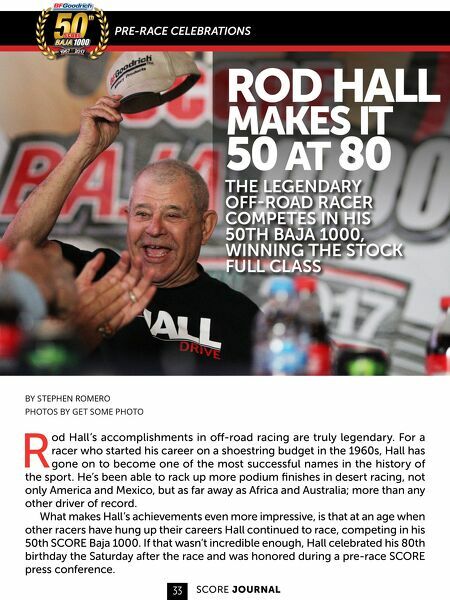 Rod Hall Makes It 50 At 80 The legendary off-road racer competes in his 50th Baja 1000, winning the Stock Full class By Stephen Romero Photos By Get Some Photo Rod Hall’s accomplishments in off-road racing are truly legendary. For a racer who started his career on a shoestring budget in the 1960s, Hall has gone on to become one of the most successful names in the history of the sport. He’s been able to rack up more podium finishes in desert racing, not only America and Mexico, but as far away as Africa and Australia; more than any other driver of record. What makes Hall’s achievements even more impressive, is that at an age when other racers have hung up their careers Hall continued to race, competing in his 50th SCORE Baja 1000. If that wasn’t incredible enough, Hall celebrated his 80th birthday the Saturday after the race and was honored during a pre-race SCORE press conference. The event honored Hall for his efforts and in reply, he showed his enthusiasm for racing, reminding other racers that although he’s competed in 50 Baja 1000 races, he’s only had one Overall win. At 80 years-old Hall still has a unique sense of humor that has endeared him to legions of fans. His spirit to buckle up and tackle the most demanding terrain no matter the age or ailments is enough to inspire everyone who continues to seek that elusive prize. Diagnosed with Parkinson’s Disease a few years ago, one might think Hall would quit or at the very least slow down. Yet, he remains sharp, and his love for the sport shines as bright as it did during the ‘60s when he just a young man on a mission to challenge himself against all odds. At the 50th BFGoodrich Tires SCORE Baja 1000, his efforts paid off once again. He won the Stock Full Class with a time of 37:05:07 co-driving with his son Chad who was by his side as they took the checkered flag in his Hummer race vehicle.SJ Rod Hall was honored by SCORE and BFGoodrich Tires for competing in his 50th Baja 1000 Hall inspires racers with his colorful tales and humor.